Want to Swim With Dolphins in Oahu Hawaii? Here's How and Where. Want to Swim With Dolphins in Oahu Hawaii? Here's How and Where. Don't you find it amazing that dolphins have become humans’ best friends in the ocean, and happy that you can easily swim with dolphins in Oahu? These clever mammals are to us in the ocean what dogs are on land, and this natural attraction has made a dolphin encounter one of those island activities you just have to do. It definitely was on our bucket list when we visited Oahu in Hawaii! 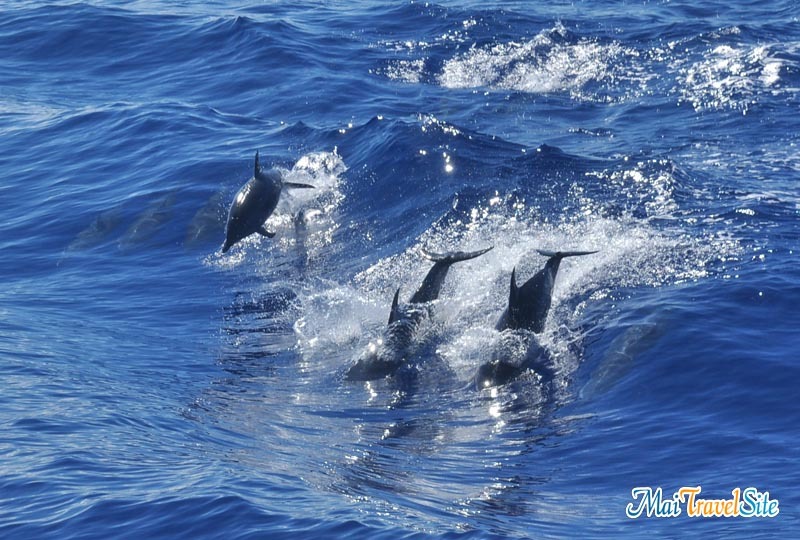 In Oahu this is very easy accomplished, as you can simply join one of the many North Shore dolphin swim tours in Hawaii and better West coast tours where dolphin excursions are very sought out experiences. What to expect of a wild dolphin encounter experience. I’m one of those people who prefer to see animals in their environment. I like to see them free, observe how they approach us and how curious they are about what we humans do, and want my kids to experience this when possible. Some time ago I had been on a dolphin watch in Puerto Vallarta (Mexico) and it turned out to be a magical moment I will not forget. Do dolphins like to swim with humans? Apparently so. The dolphins we saw were naturally interested about who we were and swam to and around us. Unfortunately the water was murky and visibility not the best, so having the chance to join a dolphin swim in the clear blue waters of Oahu’s west coast I did not hesitate. Are you traveling with young kids? Are you and your family all strong swimmers? Are you or someone in your family prone to get dizzy on a boat? If you answered yes to any of these questions then swimming with wild dolphins is probably not the best option for you. The ocean was crystal clear! We were actually cruising very fast when I took this picture. If this is your case you have two very easy and convenient options: Dolphin Quest Oahu or Sea Life Park Oahu (the only Sea Life Park in Hawaii). Dolphin Quest Oahu offers swimming with dolphins in Oahu and two more locations, and focuses on conserving and studying these magnificent sea mammals we all love. Dolphin Quest Oahu is located inside Kahala Hotel and Resort, making it very convenient if you decide to spend a few nights here. Sea Life Park Hawaii is a small family oriented Oahu aquarium that has several sea life and dolphin encounter programs- you can check their schedule here . Plan on spending some time walking around while your kids learn about the ocean and its creatures! However many find these parks non ethical, and while I do understand they are the only way for little kids to see and learn about ocean I highly recommend you swim with wild dolphins instead if you are traveling with older kids or as adults. 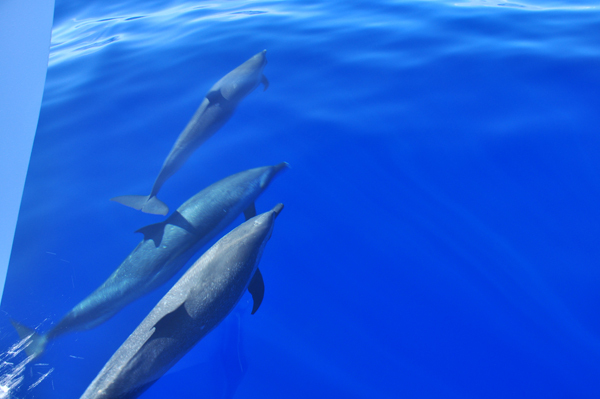 Imagine being able to see a spinner dolphin like this in the wild while you're in Oahu! Almost all- if not all- of the Oahu dolphin swim tours are on the West coast of the island. The reason is that the ocean is less choppy on this side of the ocean making sailing, and spotting them, easier. Oahu’s West coast has a permanent pod of about 200 dolphins (most of them are spinner dolphins) that makes observing them very easy. We joined the Best of the West tour with Sail Hawaii, an experienced operator that not only caters to tourists but studies these fantastic creatures too. All dolphin swim tours in Oahu start early in the morning, so make sure you plan ahead. Our tour left Waianae harbor at around 8 am, so make sure you begin your 2 hour bus commute from Honolulu early- or perhaps even better rent a car for a day with Cheap Rent a Car. These guys will get you on four wheels for around 25 USD per day, well worth it in my opinion. Luckily for us we were taken there by Mario and Jose, two friends from Spain we had made a few days before making the trip that much easier, and eventually they decided to join the Oahu dolphin swim tour as well. It was a beautiful morning, with a neon blue sly and dark blue ocean, split by lush green mountains when looking at the shore. Only 20 minutes after leaving the harbor did the first Oahu dolphin appear, leading the boat at times and playing in the wake at others. Soon the rest of his group appeared- most were spinner dolphins which would leap and complete three or four spins when airborne. And then the real fun began. We were offered some healthy snacks (included in the tour price) and were instructed to sit at the back of the boat and get ready to jump into the ocean. Unfortunately it is mandatory to wear a personal flotation device, which makes the swim safer and lets the staff spot the swimmers easily but also limits your swimming abilities more than I would like. In any case with a little effort you can dive a few meters. The captain would leave the dolphins behind and we'd jump into the water ahead of them, and wait for them to reach us. In order to increase the interaction with the dolphins the captain will drop you about 100 meters ahead of where the dolphins are and in the direction they were swimming, the idea being that when they find you they will become interested and swim around you. But alas, not this time, as they swam right under us and continued their way. We repeated the process two more times with the same results, and then learned that a nomad pod of about 300 dolphins was swimming along the coast and all the local dolphins were heading their way to check them out- not surprising as dolphins are very social. 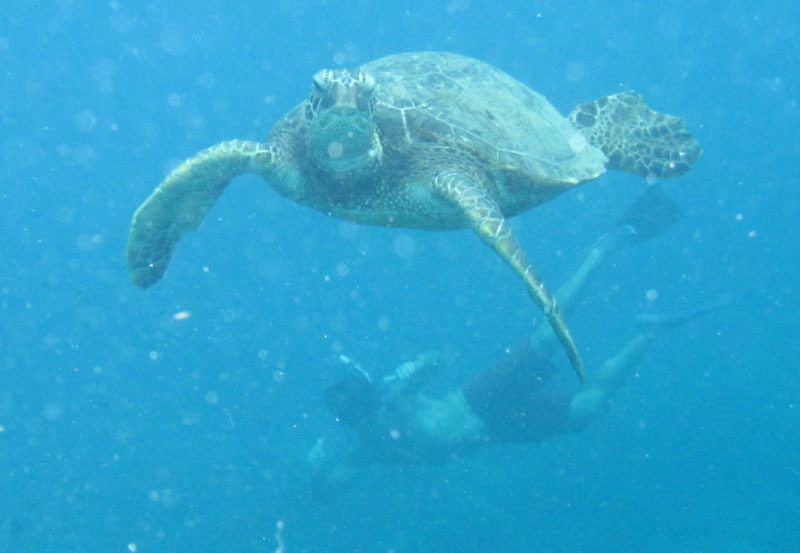 We then made our way to the second part of the tour: a snorkeling session where we were guaranteed we’d see wild turtles swimming freely- and we did. The reef itself is not exuberant in life, but there is a particular spot where huge turtles show up to have parasites eaten a by a particular species of fish. This symbiotic relationship creates a magnificent opportunity to take pictures and video if you have the appropriate gear- which I strongly recommend you do when doing incredible tours like this one. After about 40 minutes of snorkeling (which seemed more like 10!) we then swam back to the boat and made our way back to the shore munching a bit more along the way. This said you may want to know where to swim with turtles in Oahu for free, something I did a few days later. 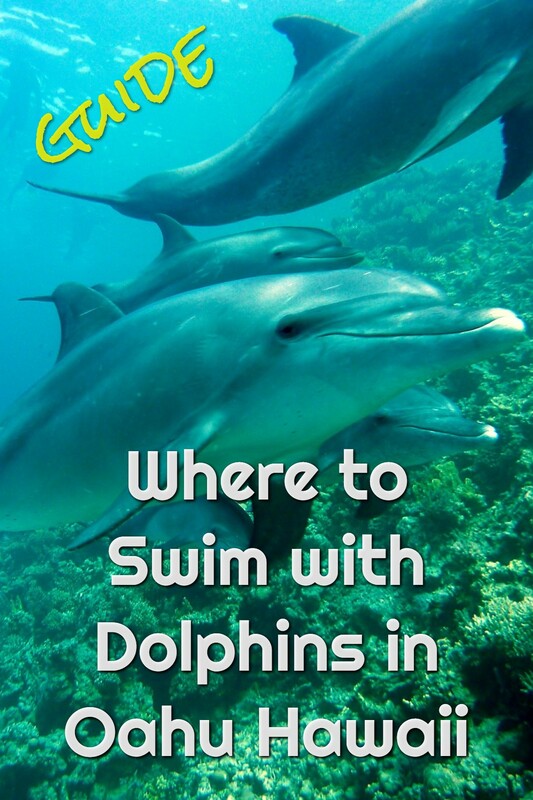 Book a tour that includes swimming with both dolphins and turtles! 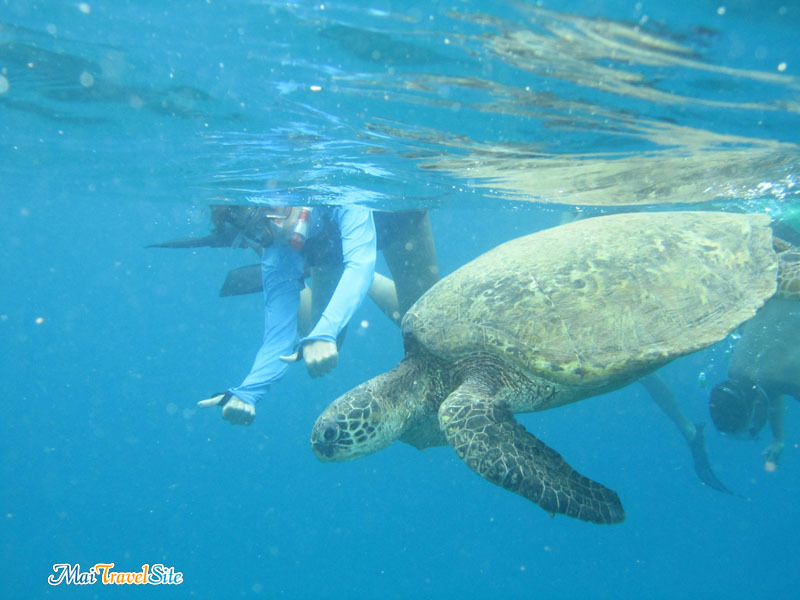 Not all dolphin swim tours include swimming with turtles as well, so try to book a tour that offers both- specially if your Oahu vacation is on the short side. 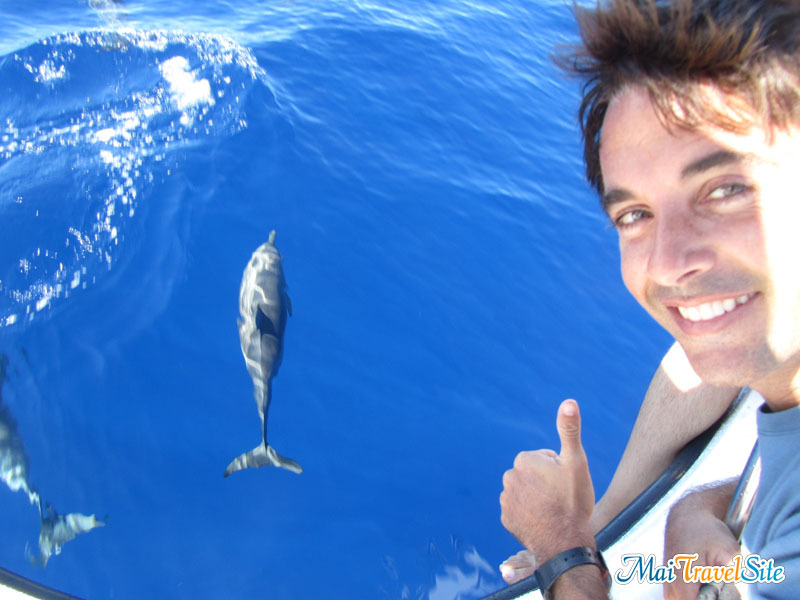 Best of the West is a fantastic tour to join if you want to swim with dolphins in Oahu, but there are others. The boat is big enough to fit comfortably eight passengers and the crew, the snacks are healthy and abundant and the staff is knowledgeable and exciting. It was a pity that this time the dolphins did not interact as much as they usually do when in the water, but you can’t control nature. I do have to say that having to use the personal flotation devices even if you’re and experienced swimmer rather annoying, although I can understand the safety concerns of the crew (you don’t have to use it during the snorkeling session though!). Overall Best of the West is a superb tour I highly recommend- simply check the pictures and video I filmed that day! Booking.com has over 500 hotels in Oahu including apartments and resorts. You get free cancellation on most rooms and a best price guarantee. Check prices. Don’t forget Airbnb for your home rental stays. RentalCars.com is the world’s biggest car rental booking service that compares all the major brands like Hertz, Avis, and Alamo. Check prices for Honolulu airport. Outdoorsy is the largest RV rental marketplace on the planet. They offer ease, flexibility and some unique and cool campervans for your Oahu road trip. Find your RV rentals for Oahu here. Get Your Guide offers small group tours and activities in Oahu including tickets to the popular Oahu attractions. I've done dozens of tours with them and have enjoyed them all!